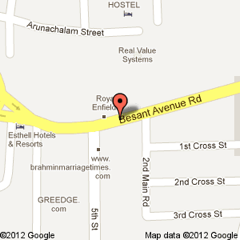 Besant Avenue is the stretch from Aavin circle to Rajaji Bhavan in Besant Nagar. 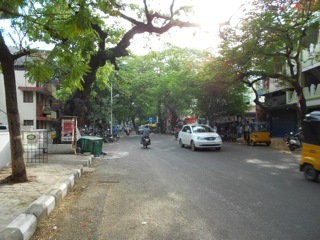 Important landmarks on this road are the Theosophical Society, The School – KFI, Olcott Memorial School and Rajaji Bhavan. 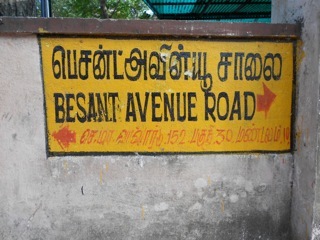 Besant Nagar is also named after Annie Besant, as is Dr Besant Road near Vivekananda House on Marina Beach. Annie Woods was born in London on 1 October 1847. Reports indicate that her childhood was rather unhappy, especially after her father’s death when she was only five. In 1867, Annie married Frank Besant, a clergyman, and they had two children. However, Annie’s disenchantment with religion led to a legal separation in 1873. Besant became a member of the National Secular Society, which preached ‘free thought’, and also of the Fabian Society, the noted socialist organisation. Besant supported a number of workers’ demonstrations for better working conditions. In 1888 she helped organise a strike of the female workers at the Bryant and May match factory in east London. The women complained of starvation wages and the terrible effects on their health of phosphorus fumes in the factory. The strike eventually led to the management significantly improving their working situation. In the 1890s Annie Besant became a supporter of Theosophy, a religious movement founded by Helena Blavatsky in 1875. Theosophy was based on Hindu ideas of karma and reincarnation with nirvana as the eventual aim. Besant went to live in India but she remained interested in the subject of women’s rights. She continued to write letters to British newspapers arguing the case for women’s suffrage and in 1911 was one of the main speakers at an important NUWSS rally in London. In India, she was a founder-member of the Women’s India Association (WIA), the first feminist organization in India. As a member and later leader of the Theosophical Society, Besant helped to spread Theosophical beliefs around the world. She was an outstanding orator of her time, a champion of human freedom, educationist, philanthropist, and author with more than three hundred books and pamphlets to her credit. Besant first visited India in 1893 and later settled there, becoming involved in the Indian nationalist movement. In 1916 she established the Indian Home Rule League, of which she became president. She was also a leading member of the Indian National Congress. In the late 1920s, Besant travelled to the United States with her protégé and adopted son Jiddu Krishnamurti. (n.d.). BBC : History : Annie Besant . In BBC. Retrieved May 5, 2012, from http://www.bbc.co.uk/history/historic_figures/besant_annie.shtml. (2010). Annie Besant (1847-1933). In The Theosophical Society. Retrieved May 5, 2012, from http://www.ts-adyar.org/content/annie-besant-1847-1933#Sources. (n.d.). Annie Besant : Biography . In Spartacus Educational . Retrieved May 5, 2012, from http://www.spartacus.schoolnet.co.uk/Wbesant.htm#source.